More substantial than wings, but with all the great flavor, Buffalo Dogs are a game-winner every time! Grill, broil or sauté the Hoffy Hot Dogs, basting with Buffalo Wing Sauce during cooking. In a small mixing bowl, combine 1/4 cup Buffalo Wing Sauce and mayonnaise. Stir to combine well. Dice three of the celery stalks, and cut the remaining celery into sticks for snacking. To assemble the dogs, toast the hot dog buns. 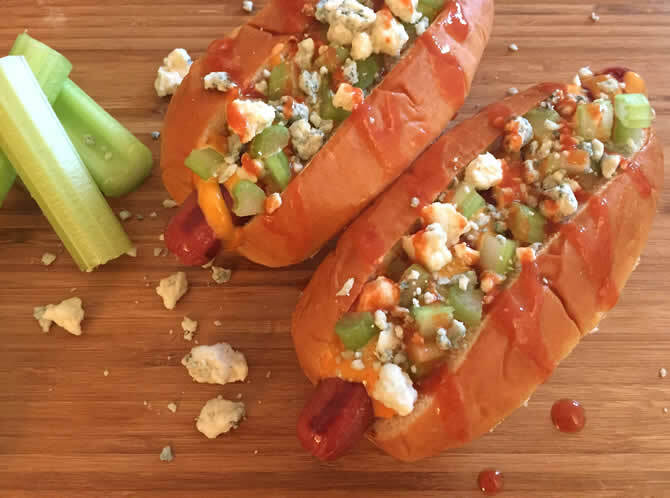 Place a cooked Hoffy Hot Dog in each bun and drizzle with the Creamy Buffalo Sauce. Top each dog with a sprinkling of diced celery and crumbled blue cheese. Garnish with an extra drizzle of Buffalo Wing Sauce.